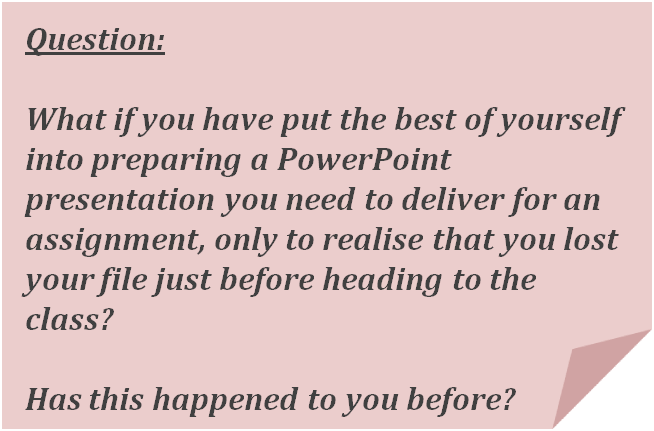 I started the session by asking the students a similar question I posed at the beginning of one of my previous posts. Interestingly, all students had a similar experience. Initially, they were puzzled by my question but then one by one started talking about their experiences. I then continued by saying that I was asking this question because this is what happened to me that morning. They exclaimed and opened their eyes widely when they heard about my disaster! I could see they could connect with me. I then told them that when something goes out of plan, I always wonder what the lesson is for me and then asked them if they learnt anything from their own similar experience. Most of them focused on the dependency on the digital medium, so their lesson was to keep a printed copy of everything. While reflecting with them during the discussion, I told them I was still trying to identify what my personal lesson here was, and that the only thing I could probably pay attention to is that there is no such thing as perfection! My computer crashed while I was looking for perfection in the visual effects I was adding to the content. The students said that we were there to talk about finding books and journals. I told them that I was there to demystify the assignment process and make their lives easier with finding information. But, I would need their help to make the session interesting since I didn’t have a presentation. In full honesty, I told them I totally rely on them to make the session interesting and enjoyable. I also encouraged them to tell me at the end if the lesson had met its objective and if the assignment process was indeed demystified. They all agreed with enthusiasm and I was ready to start the session rolling! This entry was posted in #fslt12 and tagged #fslt12, #infolit, Birkbeck, finding information, Information literacy, information obesity, personal attributes, personal lesson, personal qualities, reflection, reflection in-action, teaching, technology. Bookmark the permalink. Hi Eleni-I am wondering how the meeting went on Friday-I was very disappointed not to be able to come along. It was great putting a real face under a name. Very thought provoking discussions about MOOCs, how we learn through #fslt12 if we learn… I was thinking of writing a quick post storyfying Fred’s tweets. Fred’s choice to meet in the Crypt was very good. Don’t worry you couldn’t make it, I am certain we will do it again very soon, if not all together we can arrange something entre nous.